Two Indigenous ‘sisters’ come together to bond over the simple ritual of bathing. Their presence is arrestingly physical; Amrita Hepi and Jahra Wasasala are defiantly strong, sensuous women, similar in appearance. Dipping into buckets of water, they wash and spit. Together, they vocally tease out the words and attitudes society throws at them, along with those they’re adopting. Passing’s new language is spoken, cried and danced. Aggressive floor work, writhing and wailing remind us that beyond the performers’ physical grace lies a history of relentless struggle, assault and suffering. 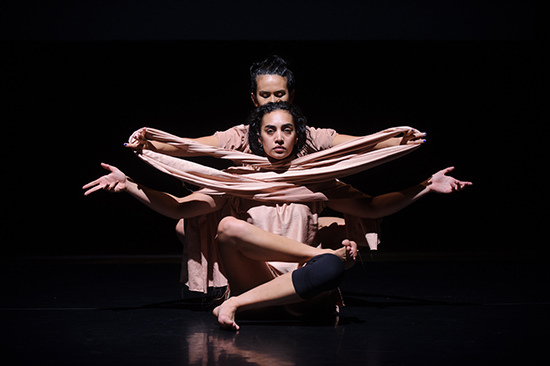 The two women inhabit distinct physicalities: Wasasala attacks the floor with her body, Hepi uses hers to articulate words with staccato precision, but the chemistry between them is never in doubt. They move within each others’ space with intimacy and familiarity. The movement quality of Passing is highly tactile: skin against skin, full body against tarquette. Honey Long’s tonal costumes—long swathes of fabric binding and defining the performers’ bodies—further accentuate an awareness of skin and possession in the work. Colonial eras are evoked in a short series of vignettes—a patronising early movie-reel sound recording asserts male, distinctly British propaganda, “All of me,” sung by Billie Holiday, resonates with the power of absent solidarity—before Passing arrives at its crux. Hepi binds Wasasala, then addresses her prisoner. The hip-hop influenced articulation of her monologue—the body pops, the crisp hand-flicking—implies a distinctly 21st century attitude towards her heritage. “We’re all the same in the spirit,” she utters, not as a platitude. She climbs onto Wasasala’s prostrate body, forcing her further into the ground. Elsewhere in the work, Wasasala’s poem ‘bloo/d/runk’ is recited: “I savour the after-taste of an apathetic ancestor.” With the mention of spirit and acknowledgment of previous generations it’s a small leap to read Wasasala now as a captive ancestor. Ancestor or present-day sister, her response is forceful rather than complacent. The result is a confrontational physical conversation. The women are well-matched in physique and their struggle feels genuine. Hands at each others’ throats, the balance of power shifts uncertainly before they finally arrive at a kindred understanding. When their struggle subsides, the water in their buckets is combined into one source. Hepi crouches before Wasasala, and invites her to drink. Wailing, but more quietly than before, Wasasala repeatedly kisses Hepi’s forehead, gently releasing water across her face. The water traces the contours of her open eyes and cheeks; tears shed and shared. Maximilian plays with fashion, dance, choreography, photography, video, performance production and direction in no particular order or hierarchy. His formal training is in design. His recent work includes Bless the Beasts: Shibuya Summer (Melbourne Fringe 2015).